Dam Lamb from motoxaddicts takes a look at this weekends USGP. Here we go, ladies and gentlemen: the 2015 United States Grand Prix is here. This weekend is the final round of the 2015 FIM Motocross World Championship series and it’s taking place at Glen Helen Raceway in San Bernardino, California. Youthstream is bringing their massive infrastructure to Glen Helen from across the globe for the event along with some of the best riders on earth. The last USGP was back in 2011, and by most accounts, it was sadly anything but a commercial success. With fan attendance at an all-time low, the fans that did come were treated to great racing and abnormally comfortable viewing. This year, though—just based on what we have been hearing through the grapevine—Glen Helen should have more fans on hand to witness what is always an incredibly competitive series. Originally when this race was scheduled, the plan was for American MXGP World Championship hopeful, Ryan Villopoto, to end his career and possibly win the World Championship in front of his home fans, but that scenario looped out in Italy. The show must go on, and as it sits now, America has four, solid podium contenders in Rockstar/Husqvarna’s Jason Anderson, Monster/Kawasaki’s Josh Grant, BTO/KTM’s Davi Millsaps and Star Racing/Yamaha’s Cooper Webb confirmed to race and MXGP. Joining the American AMA riders are our own European transplants as well. That list includes Red Bull/KTM’s Scottish-born pilot Dean Wilson and the former MX2 World Champion, Red Bull/KTM’s Marvin Musquin. The Frenchmen knows how to win Motocross World Championship races, and he and Deano both know how to get around Glen Helen as as fast as any rider in the world on any given day. While the top two Americans from the 2015 Lucas Oil Pro Motocross Championship—Ryan Dungey and Justin Barcia—will not be in the house, there’s enough of an AMA contingent to give this weekend’s event a little bit of that AMA versus the World feeling of USGPs of the past. If you’re anywhere near Glen Helen this Saturday, we urge you to support this race and try to reignite the AMA versus the World vibe of the 1970’s. If the fans show, they will be treated to an incredible show. Add the seven AMA podium contenders we mentioned above in with the World Championship regulars like multi-time MXGP World Champion Red Bull/KTM’s Antonio Cairoli, recently crowned World Champion Monster Energy/Yamaha Romain Febvre, Hitachi/Riva/KTM’s Shaun Simpson, Honda’s Gautier Paulin, IceOne Racing/Husqvarna’s Max Nagl as well as the Kiwi Ben Townley’s return to MXGP racing and you have one hell of a world class event. Cooper Webb isn’t a stranger to the 450. Back in 2013, he made his indoor debut at the Monster Energy Cup on the bigger bike. Last year he raced, and won, on the 450 at the final round of the All Japan Nationals. But Webb admitted earlier this week to our own Jason Weigandt that he’s had to make adjustments to his style to suit the bigger bike. “I’ve learned quickly that the two are quite a bit different,” he said. “The setup, the power, everything is quite a bit different. I’ve had to change the way I ride to ride the 450 better.” This weekend is important for Webb—not to win; no one is expecting him to—but to gain valuable knowledge on settings, etc. ahead of next week’s Motocross of Nations where he will make his first appearance at the event riding a 450. Marvin Musquin won’t be racing the 450 next weekend for Team France at the Motocross of Nations—he will move back down to the 250—but due to the FIM World Motocross Championship age rule, he is forced to ride the MXGP Class this weekend. Musquin, who will move to the 450 full-time next year for Red Bull KTM, will be able to use this race for valuable gate time ahead of the MXoN and Anaheim 1. Like Webb, most aren’t expecting the 250 Lucas Oil Pro Motocross runner-up to win, but would you be surprised if either he or Webb landed on the podium? While he wasn’t on anyone’s radar entering the season, MXGP rookie Romain Febvre has run away with the championship. Winner of ten of the last fourteen motos—and three straight—Febvre enters the weekend as one of the hottest riders in the world. Fair or not (I say not), many will point to Febvre’s title run as a consequence of attrition. MXGP heavyweights Antonio Cairoli, Clement Desalle, Ryan Villopoto, and Max Nagl all missed significant time this year, and like Ryan Dungey has dealt with before, many will want to (unfairly) put an asterisk beside his championship. Febvre can silence a lot of critics this weekend (and even more so next weekend at the MXoN) with a win. Can he end the year with five straight moto wins? Behind the oohs and awes, you could hear a collective gasp of air being let out of the MX2 championship battle last weekend. Pauls Jonass floated through the air in a crash akin to Chad Reed’s crash at Millville, and ended up leaving Mexico 18 back of fellow 18-year-old Tim Gajser, and barely clinging to a chance at the world title. With such young riders fighting for a championship, mistakes are bound to happen, so the possibility of Jonass getting back in the championship is still open. Keep an eye on the battle this weekend, as both look to lock up their first career MX2 title. The word coming out of the California test tracks the last few weeks is that Jason Anderson is showing incredible speed. Anderson will be racing the all-new 2016 Husqvarna for the first time, and when KTM made similar changes to their bike with the Factory Edition 2015 model, well, Ryan Dungey started going much faster. Our own Jason Thomas, who was participating in a 450 shootout for Dirt Rider in California, said that Anderson “looked to be very comfortable on the new Husky and was logging visibly the quickest laps amongst many of the other MXGP hopefuls.” He went on to say that “if he can find his way to the front on that long Glen Helen start, he may have the speed to run away with a Grand Prix win.” That’s first-hand insight from a former pro. I’ll leave it at that. It’s no secret this is a huge weekend for Josh Grant. Currently without a deal in place for 2016, Grant, whose season was remarkably consistent but lacked the typical flash race we usually see from the veteran, could reignite interest for next season with a strong performance. Glen Helen is a home away from home, as success has come often here for the SoCal native. An overall podium in 2009 was followed by a moto win five years later when he returned to the track in 2014. If things click for Grant this weekend, a moto win or overall isn’t out of the question. 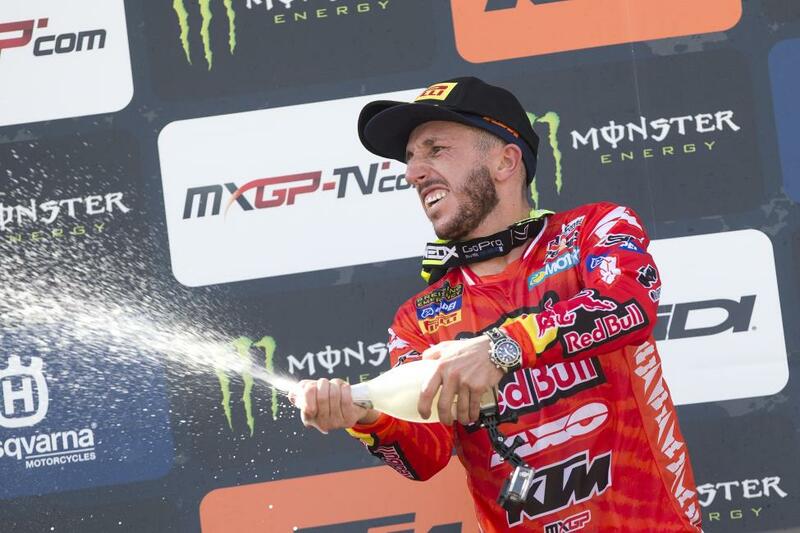 Antonio Cairoli’s bid for a seventh straight MXGP (formerly MX1) title came to an abrupt end when he injured his elbow at his home GP in Maggiora. Cairoli rode through the pain briefly, before deciding to pull out of the championship chase prior to the MXGP of Czech Republic. The eight-time world champion missed the next five rounds, dropping him to seventh in the MXGP standings, to rehab his injury, but will return to action this weekend. The Italian won the USGP at Glen Helen back in 2010 over Mike Alessi en route to his second MXGP championship. His fitness level will probably determine how far he advances this weekend, but don’t put it past the former champion to put in a podium performance. Ben Townley also competed in the 2010 USGP, winning the second moto en route to an eighth-overall performance. While Townley officially retired from racing in 2013, he continues to race select races in his native New Zealand and neighboring Australia—even winning the final round of the Australian Nationals this year—and will return to the Motocross of Nations this year for the Kiwis. While injuries beset a promising career, it will be nice to see the former MX2 World Champion, and 2007 Eastern Regional Lites Champion, back on U.S. soil for the first time since 2010. How will BT101 do in his return? It’s been a long, strange journey for Davi Millsaps in 2015. Dismissed from Monster Energy Kawasaki back in April, Millsaps was rumored to be putting together his own deal starting at RedBud, before the surprising announcement that he signed withBTOSports.com KTM dropped in early August. Millsaps will make his team debut this weekend, but more importantly, he will be lining up at an outdoor race for the first time since the Lucas Oil Pro Motocross season finale back in 2012. New bike, new team, and a return to the outdoors stack the deck against DM, so Millsaps’ expectations are probably tempered. Our man David Pingree has seen Millsaps out at some of the SoCal motocross tracks and says he looks very,very fast, but we have to think he’s using this race more for gate time ahead of the Monster Energy Cup (where he is the defending champion) more than anything else. But hey, with Millsaps, you never know! While Monster Energy/Pro Circuit Kawasaki’s Joey Savatgy has been ruled out of the race after undergoing surgery directly after the Lucas Oil Pro Motocross season finale, his teammate Chris Alldredge and the Lucas Oil/Troy Lee Designs KTM duo of Jessy Nelson and Shane McElrath (along with privateer Mark Weishaar) will be representing the home squad this weekend. 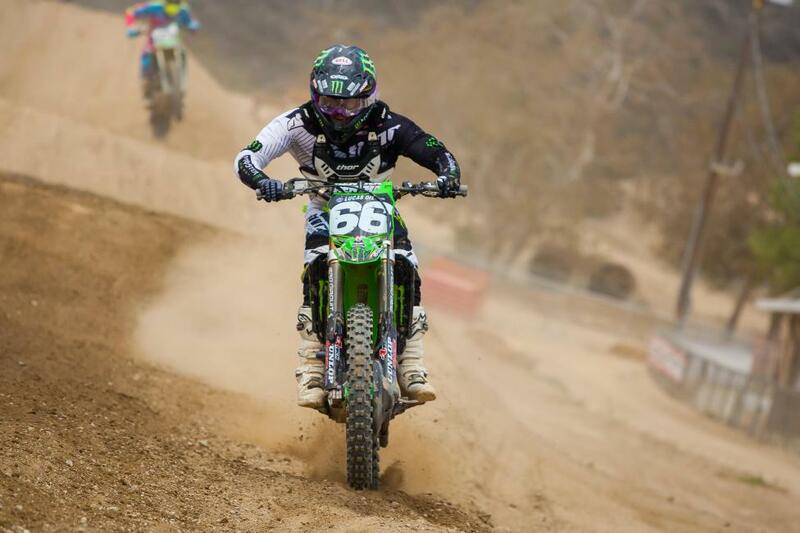 Nelson podiumed at Glen Helen back in May and should be in the running for another podium this weekend. McElrath (podium in moto two for sixth overall) and Alldredge (eighth in moto two for fourteenth overall) also had consistent days at the second round of Lucas Oil Pro Motocross. How will the Americans stack up this weekend?